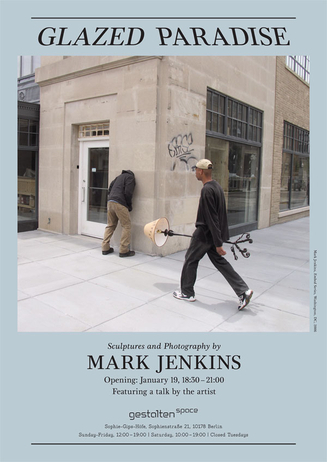 Preferably showing his art in an urban environment, American artist Mark Jenkins currently has his first solo show in Germany. Until the 4th of March, the Berlin based publishing house Gestalten shows Glazed Paradise. 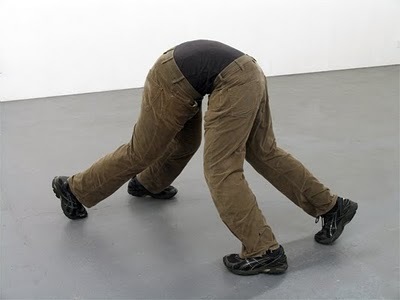 Best known for his clever installations of lifelike tape sculptures in urban and natural spaces as well as indoor environments such as cafeterias, toilets, and art galleries, Jenkins made new sculptures specifically conceived for this show. Next to this, the exhibition presents photographs of selected installations that reveal how compelling the interaction between his artwork and its environment can be.